Separate biscuits and punch a hole out of the middle. I used the large end of a piping tip to get the holes in the doughnuts. Heat about 1 inch of oil in a frying pan. You can test the oil with a doughnut hole. Oil is at a good temperature when bubbles form around the dough. When oil is hot enough, add doughnuts (make sure not to crowd the pan) and fry to a golden brown. Fry up the doughnut holes as well. The ingredients for the glaze should be mixed to your taste. If you don’t want to use Kahlua just use milk. Dip the doughnuts in the glaze once cooled a bit and then enjoy! 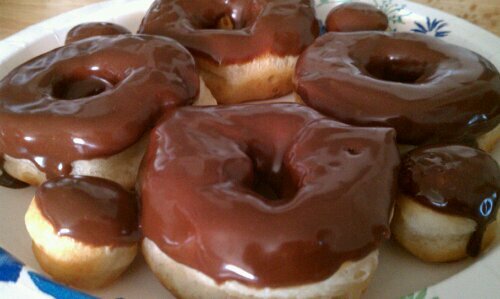 These doughnuts are so easy and delicious I plan to make them again and again.